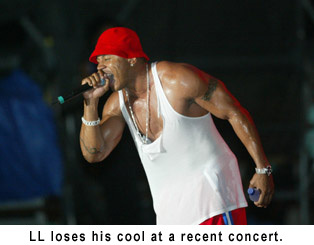 Queens, NY In a recent statement LL Cool J asserted that global warming is making it harder to stay cool. The rapper, now in his late 30�s, says he has to try harder than ever to stay cool. By no means is the rapper the first to make claims about global warming. But his position as someone who people look to as a measure for what�s cool makes many people listen. �If LL Cool J can�t stay cool, how can any of us ever hope to be cool?� asked Rita B Jarvison, a native of Queens, NY, the hometown of LL. Critics argue that LL�s difficulties should not be blamed on climactic shifts, but are more likely attributable to his advancing age. �The fact of the matter is that once a person passes forty it becomes increasingly difficult to regulate one�s cool,� said John H. Crabtree, MD.